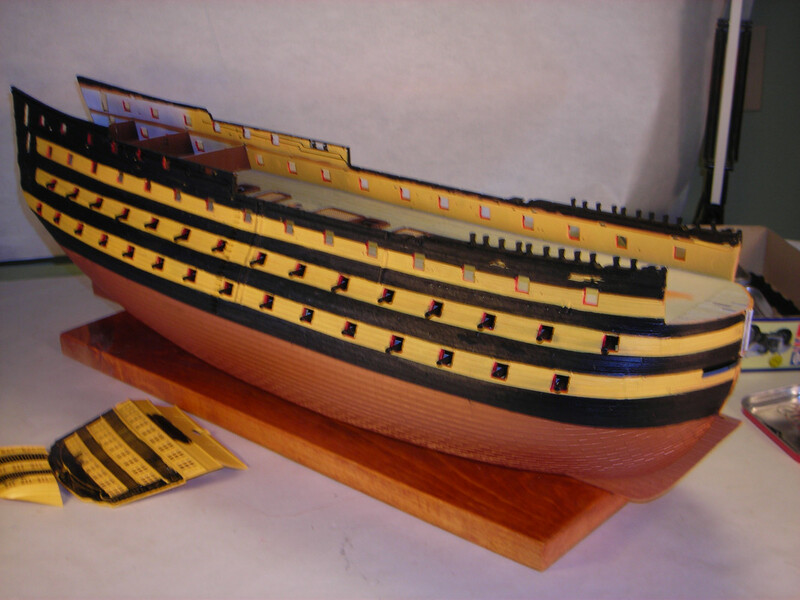 I am hard at having fun building the big HMS Victory that warshipguy gave me. What a great friend. I don't know how many ships he has given me. This is got to be a really great & fun build. I needed something after my son was killed & this has really helped. I started it in late October & it is going well. 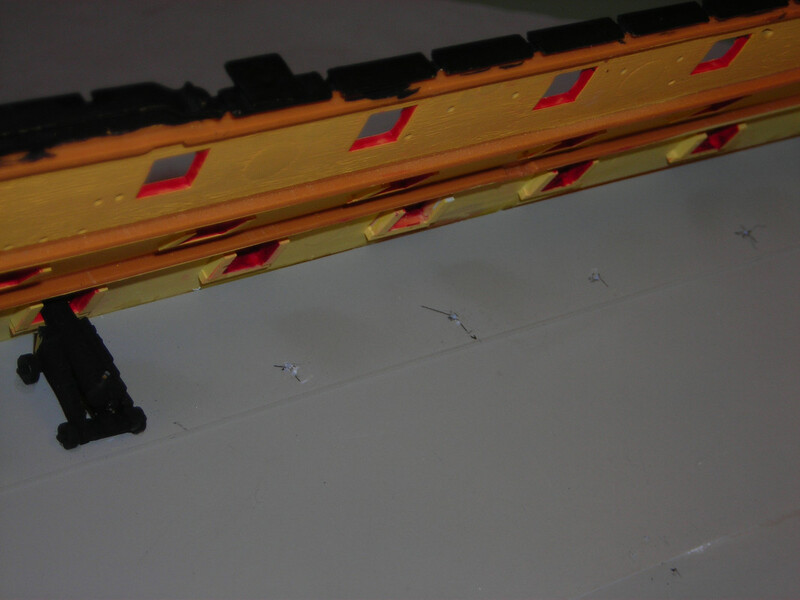 I masked all the glue ledges for the decks like I always do so the decks will glue to bare plastic. I decided to again paint my own deck like I have before. The wood decks are nice, but I think a gray painted deck is much more like the real Victory. Here are some first pictures. Nino, Jim , told me how toreset my camera just like he runs my computer for me. 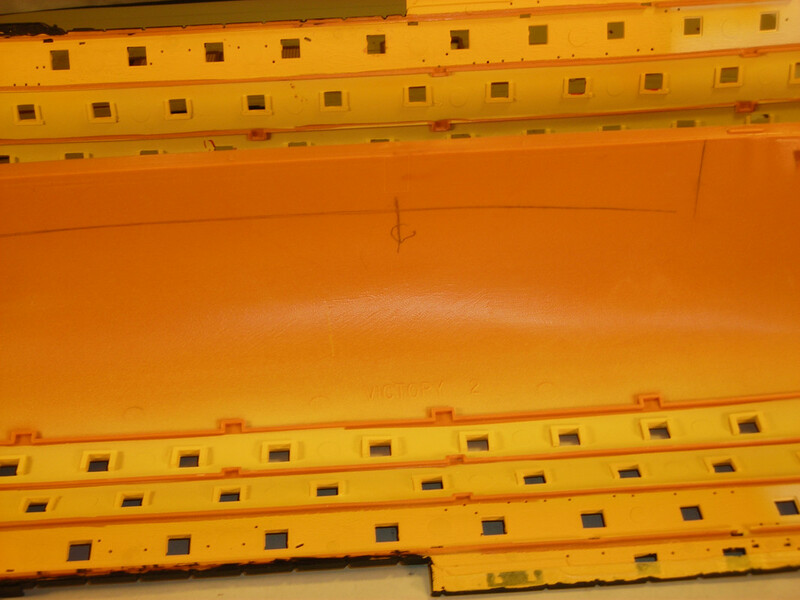 Masked ledges & thickened gunports. Tamiya Deck Tan, gray, with sharp pencil joints , than 1 coat of Dulcoat / gloss & then individual wash of very thin black & raw umber. 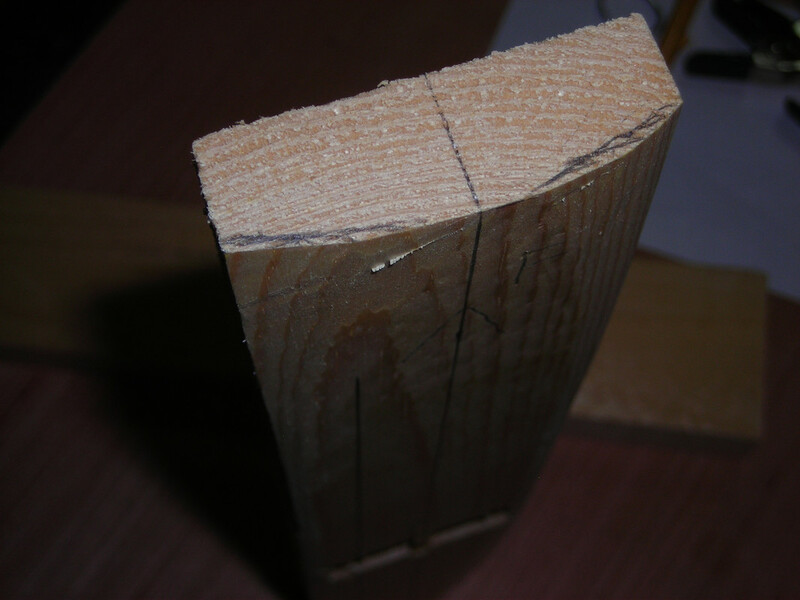 The last 2 pictures are of the 1x3 x12" 2 pieces I will glue in the hull bottom to screw into for my base. This is a big model & very easy to work on ( I haven't rigged it yet),lots of parts, but nice to work on. I am ready to start cannons. Dang Gene, you put me to shame! You did all this in less time than it would have taken me to unwrap the cellophane on the box. for crying out loud gene , I've been on mine , off and on , for 15 month's , you'll pass me some time next week . as alway's just beautiful work . To both Steve's , Mine does not even come close to what you both build. 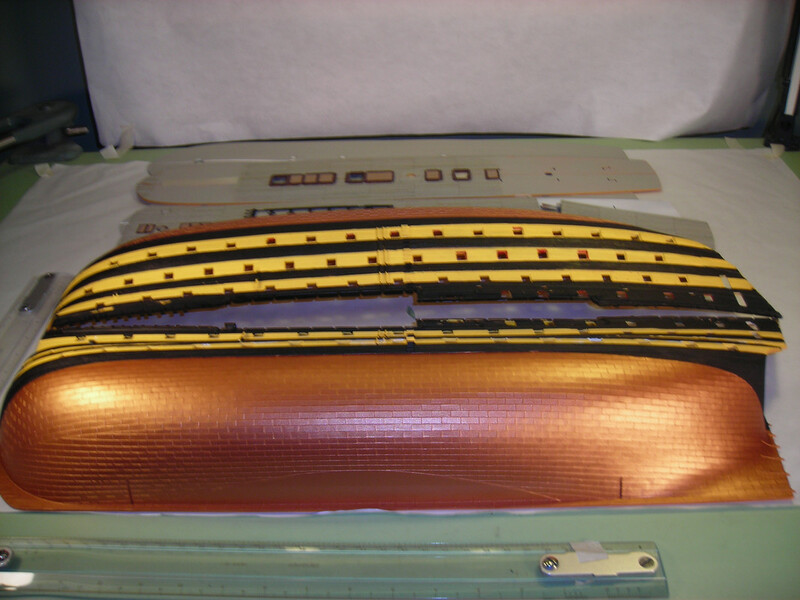 I have had trouble with getting my black hull stripe right. After I mask I always put a coat of clear gloss to seal them. I had to put 2 coats on the second one because the first on bled some.I have to go back & clean them both up. Everything else has worked fine. Docidle, that deck on the one you are building is really perfect. The whole ship is too. Gene - another one of your wonders taking shape! Your paint job on the decks look fantastic. The very same goes for the hull. I'm signing aboard on this adventure! Always good to see you at work. p.s. 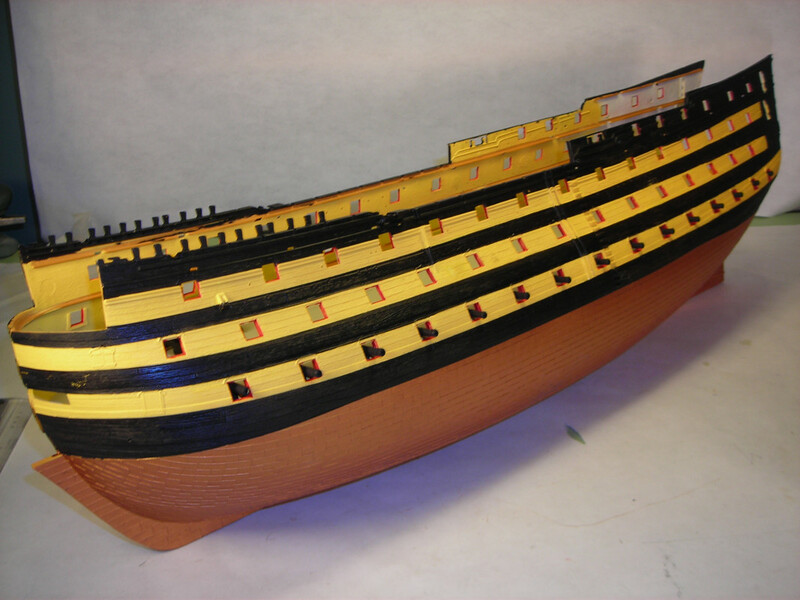 I want to thank you for your kind words and inspiration you gave to me when I started to work with modeling ships back in 2012. Cheers on your Victory!!! Looking good Gene. 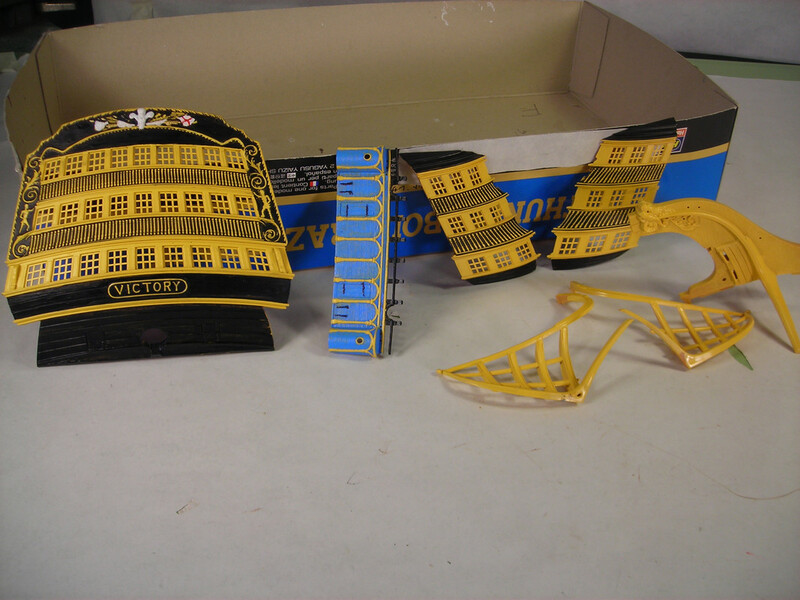 You've cracked-on with this in an impressive time; I haven't even finished the stern yet! looking forward to seeing this develop. fright (robert) & Flint ( My TV Pirate hero) Thanks for all the nice words. They make me feel good. Flint, I am not doing anywhere near the job you are. I always try to do as neat and clean a job as I can. I do sand, file & clean everything & I always wash with rubbing alcohol on all the model parts. It is quicker & I like it better than soap & water. I does dry way quicker. I am using all Tamiya acrylic paint as I have had a lot of trouble with MM peeling under masking tape. It is good if you don't have to mask. They also have some real good colors. Gene....I thought I worked fast.....your hyper-drive is working just fine. It's really hard for me to understand how quickly and fastidiously you work! Your modeling skills belie your age for sure. You're a shipwright machine! Rob & Mike thanks a lot & I like the shipwright machine, but I will be an 88 year old machine next month. I never thought about being fast, I guess I have just done models so long that everything is pretty automatic. I also am not doing all the extra things all you guys do. 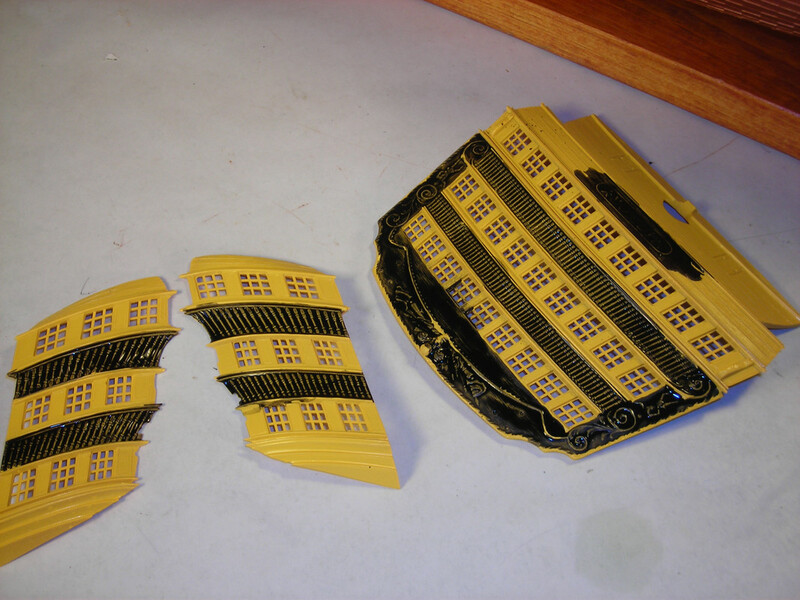 I have had some trouble with my masking over the yellow sides to paint the black. After I masked & burnished the tape, I put 1 coat of clear glosscoat to seal it after I painted & striped the first side it had bled a little. I put a second sealer coat on the other side & it was fine. You never know do you. 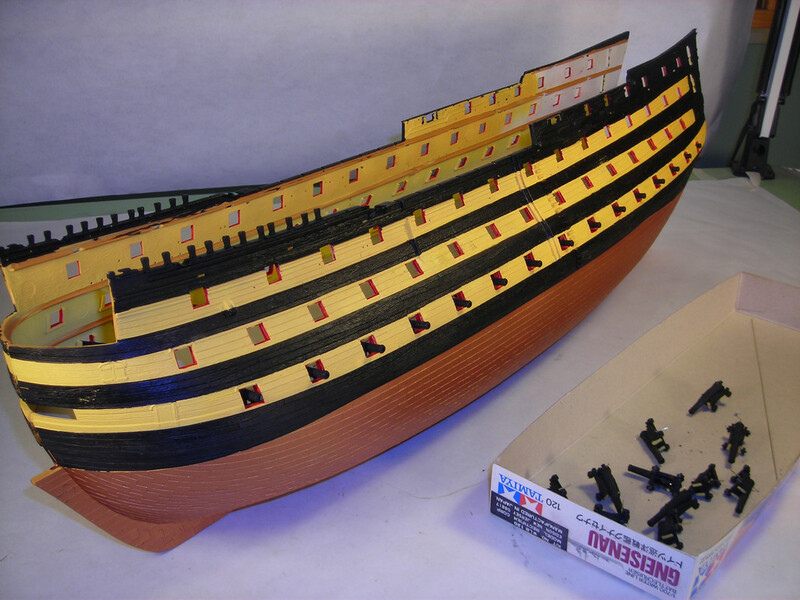 Now I will glue it together & do cannons for a month. Thanks again. I'm watching and enjoying your work immensely, as always. So, how many cannon are there again...and how many parts for each? I can tell you are having a great time with this ship. You are really forging ahead on this model. 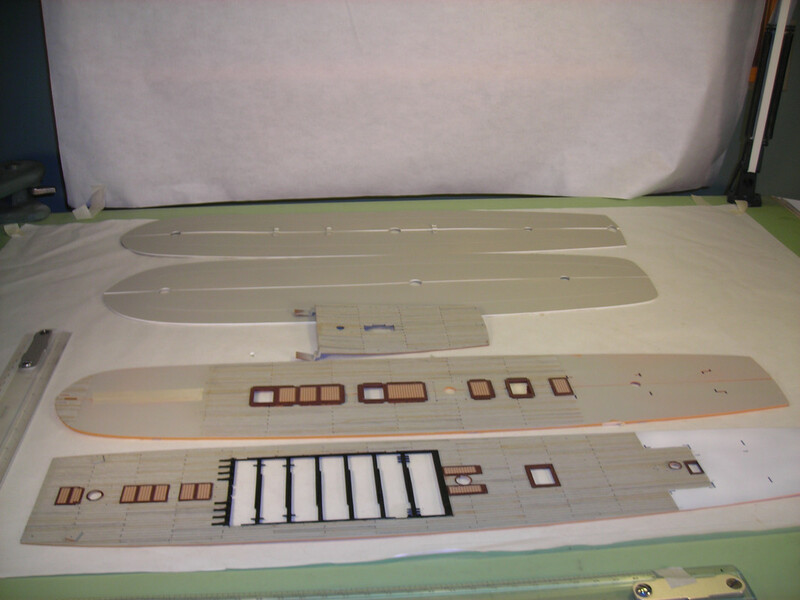 In the time it took you to paint the hull and finish the decks I would still be doing French to English translations while trying to figure out the Heller labeling scheme of numbers, letters, and more numbers on the parts. I'm curious...Are you having your meals delivered to your work table to enable such quick work? Beautiful job on the decks using the the deck tan, pencils and wash to add the shading. You are giving Scale Decks some competition. And Thanks for sharing your Victory with us. P.S. Your picture quality is better than ever, so thank you for the kind words about my suggestions. Looking really good Gene! Mine is coming up soon and I'll be watching your build diligently! 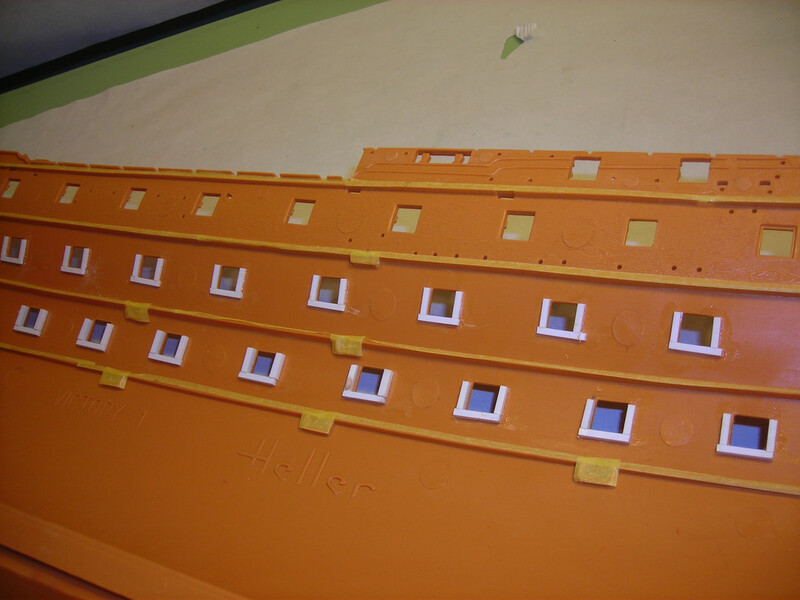 I have painted the back windows on this ship 3 times and still don't like it.How did yours come out? Jim, the only reason I have pictures on here is because of you, both for the camera & computer. I drove Mary 200 miles(round trip) to the hospital in Greenville SC for her final 2 tests. 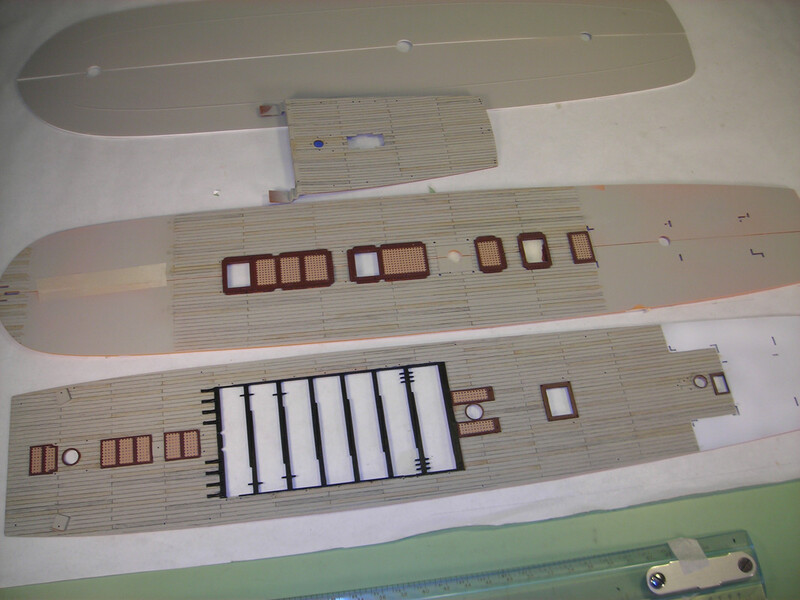 I worked on the Victory all day yesterday & glued the hull together & put the 2 big 1x3's in & put the lower deck in. 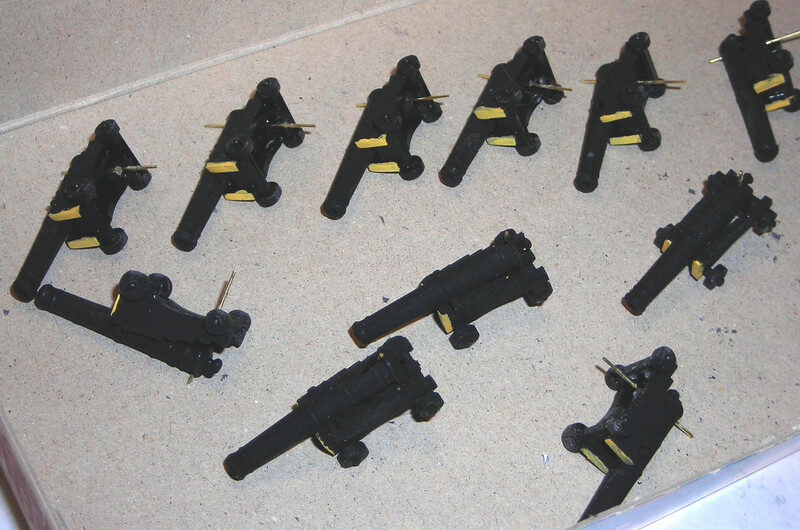 Then I seperated the cannons for size & will glue them today, part of them . There are 104 cannons with 7 pieces to each one. 728 pieces. Mark, I haven't done any window painting yet, Cannons first. 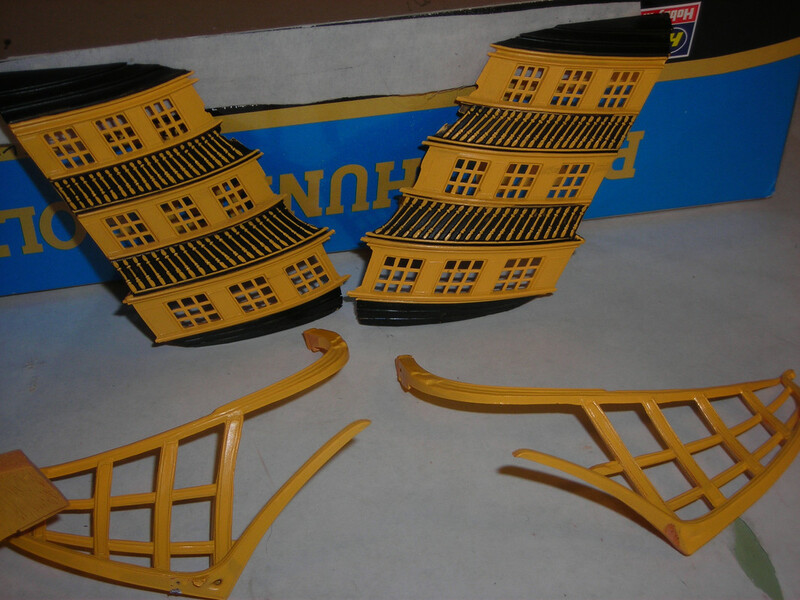 Mark, I will do my windows in yellow, along with the whole back. Then I will use glosscote over it to seal it & then,except for the large areas I will use Tempera black. When that is comletely covered & dry I will use damp Qtips to clean it off. & then seal the Tempera with dull/gloss cote mix. 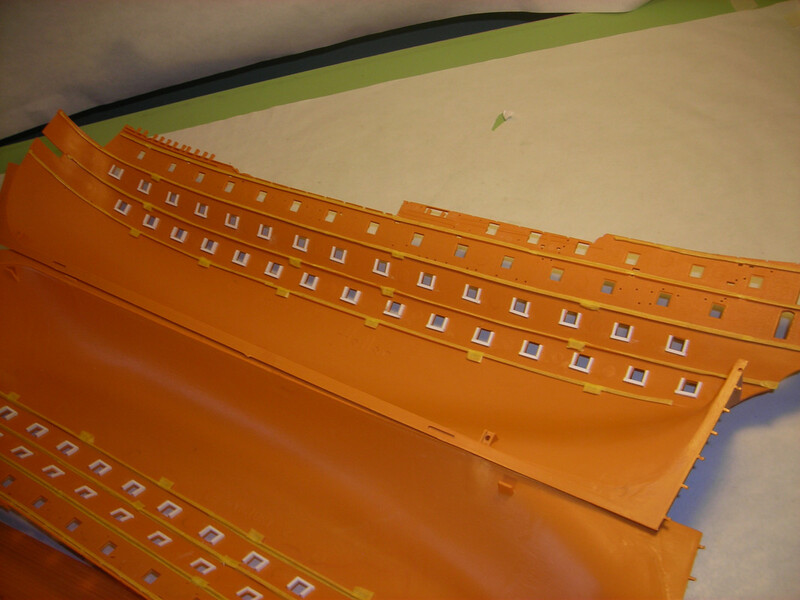 I used Tempera red on all the gunports & will seal them with dullcote & touch up with a red marker. Beats trying to do it with red paint. Thanks Gene,I'll have to try that. It really helps to make up a jig for all of those gun carriages. And a tackle box with a LOT of little compartments. 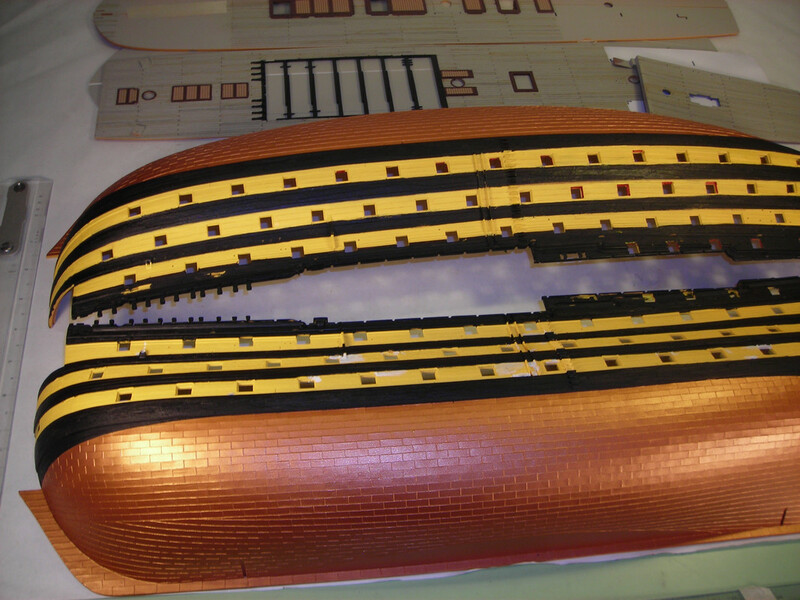 I just took new pictures of the hull together & thr first deck in with 30 cannons glued & wired in I drilled to the rear of the cannon & put a .020 brass wire in & drilled the deck in a premarked spot with a larger bit so I could find the hole easier. 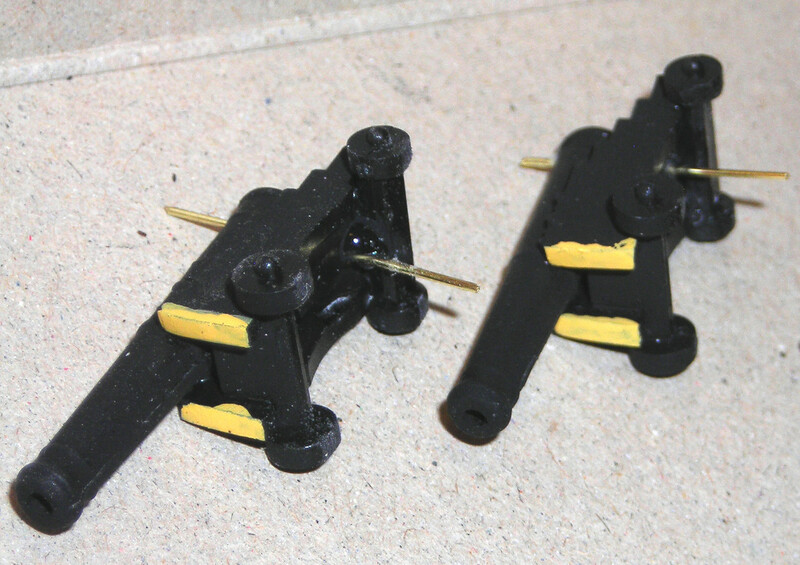 Then I flatened the wheels & used 560 white glue on the wheels & CA glue on the wire. I only painted the front of the cannon yellow as that is all you can see. The next row of deck beams has an error in the Heller instructions. Be sure to test fit, and look at the Imai page too. Thanks GM, but I already did it & cut a little off a couple beams & then glued them back on & fooled with it forever. Which one was bad? 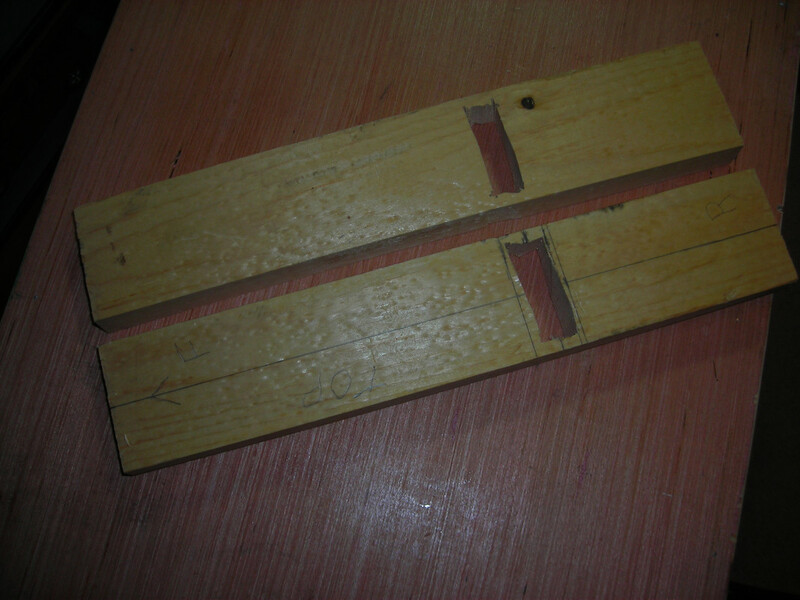 I had to take a single edge blade & scrape about 1/32 off the right side & front curve. The decks are a tough fit in all cases, but they fit good. I buy single edge blades at Lowes for $8 a hundred. I use a lot of them. I put glued beams under the next deck because it is a tight fit & I wanted the center line to have a good fit because it shows. I have already prefit it. 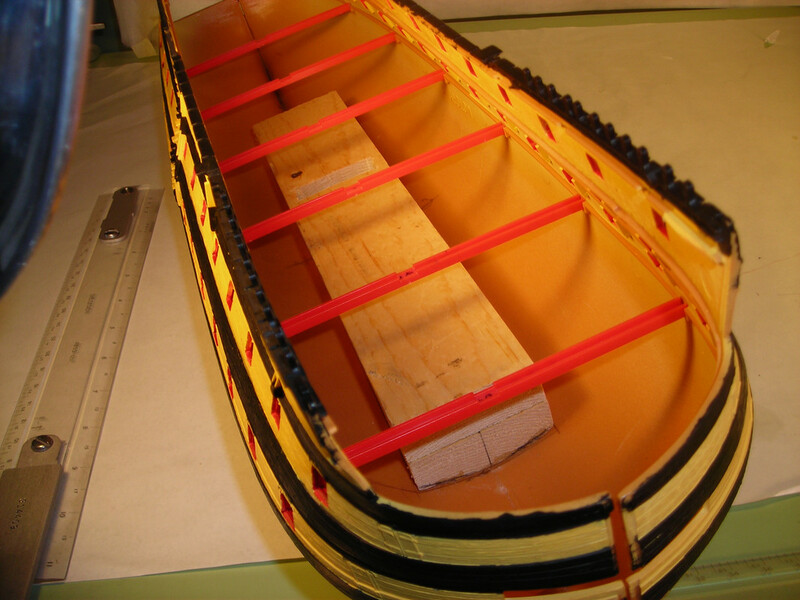 I have the cannons for the 2nd low deck ready to paint & again I will paint yellow just the front of the carriage. 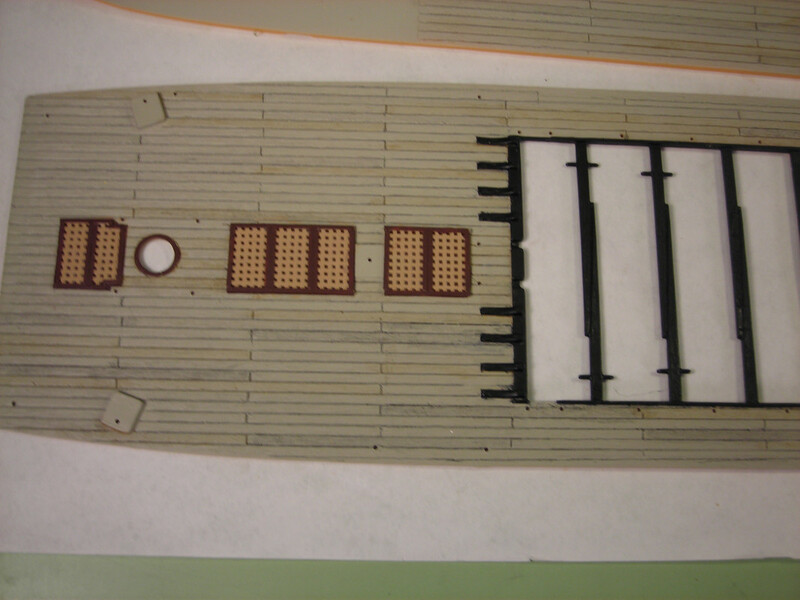 dafi, Thanks & you are one of the really great ship model builders. Your work is perfect & inspiring . Makes me want to do better. Maybe I inspire others to know they can build models up to 100 years old. That is my aim. Right now I am working on 90.
warshipguy, I thank you everytime I sit down to work on this Victory. It has been the most fun of all my ships. 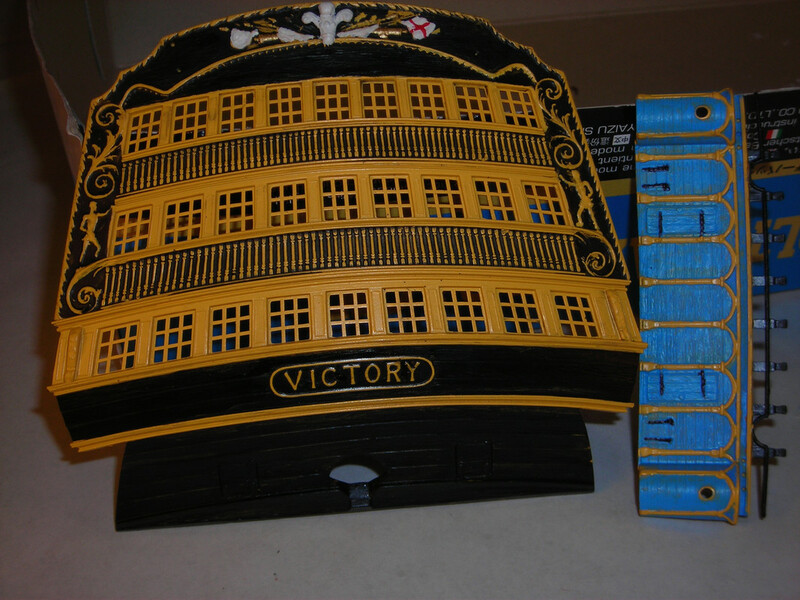 I have 60 cannons glued & wired in now & am going to put the second from top deck in today. 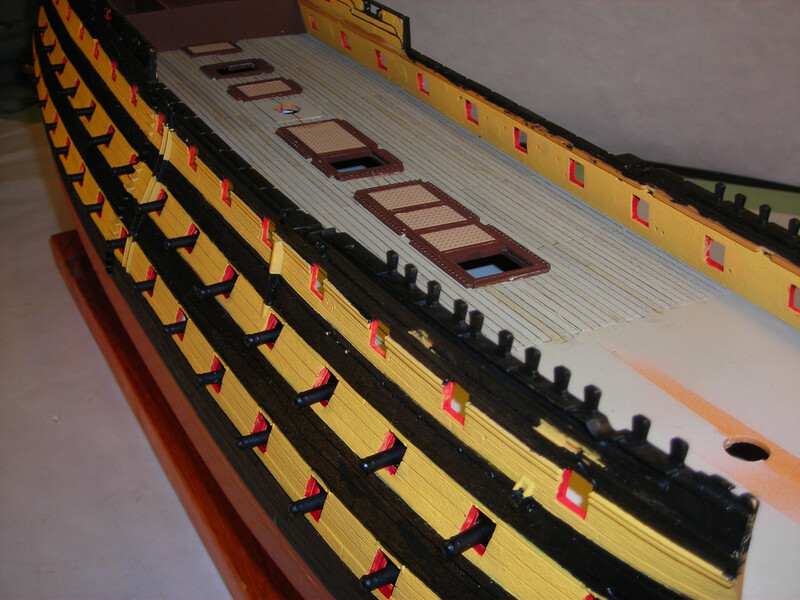 Now I can have a lot of fun with all the finished cannons & deck details. 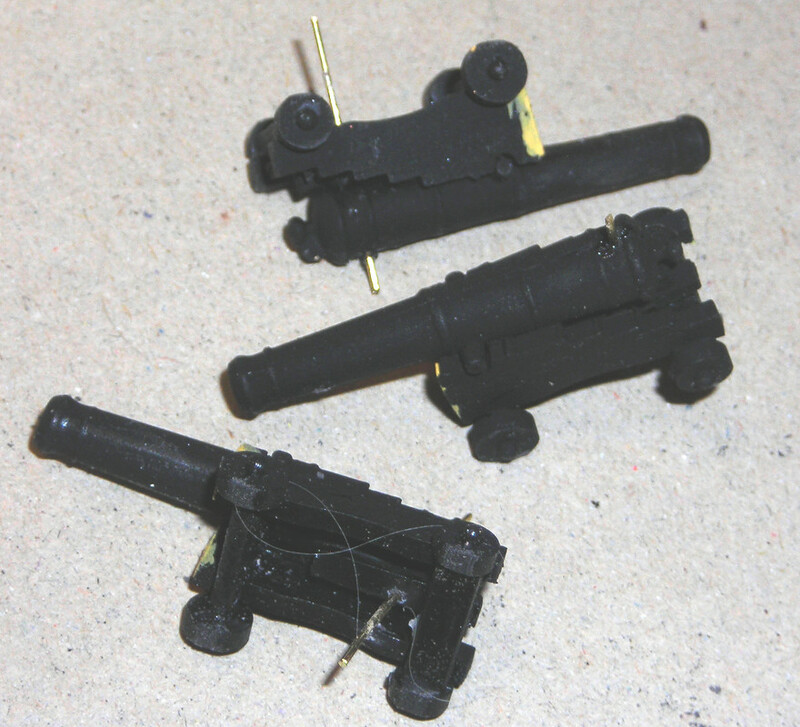 On the finished cannons, I will wire them from the bottom with only a hole up from the bottom. The wire has worked great & It will reall hold them in better.My pictures were dark & I will try to make them lighter. Nino edited the cannon picture so I will run them again, a lot more clear. For anyone wanting a firm glueing on your cannon this is woth doing. I just drilled thru from the top on the hidden cannons & painted the barrel black & yellow front only as that is all you see. 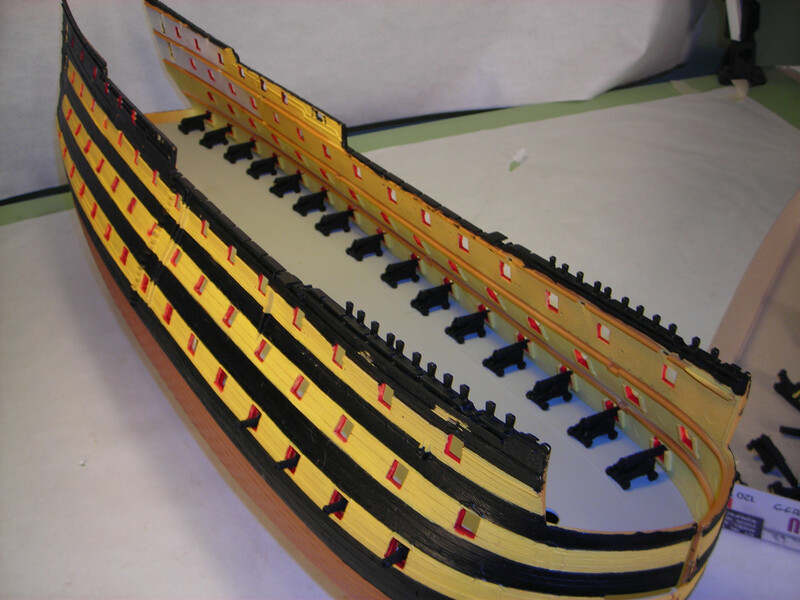 For the detailed cannons I will drill up from the bottom thru the wedge & into the bottom only of the cannon & the wire won't show.It only take a short time to make sure your cannons don't break loose in a fixed place. I put 560 white glue on all 4 flattened wheels & CA glue on the wire. I also drilled a larger hole in the deck that was easier to find. I just got back from hol's , love what you are doing mate . Love your Aussie language Mate, but what is hol's ? sorry gene , we aussies , shorten everything . that's holiday's mate . You are doing great on this Victory. I don't think you sleep. Thanks for letting me see a few "preview shots" too. The last I heard you were into the Bow area already. I've got a PM coming. House hunting related but I do mention some nautical decor on the fireplace mantel. Here are my latest Victory pictures. I had a lot of fun doing this & it turned out real well. 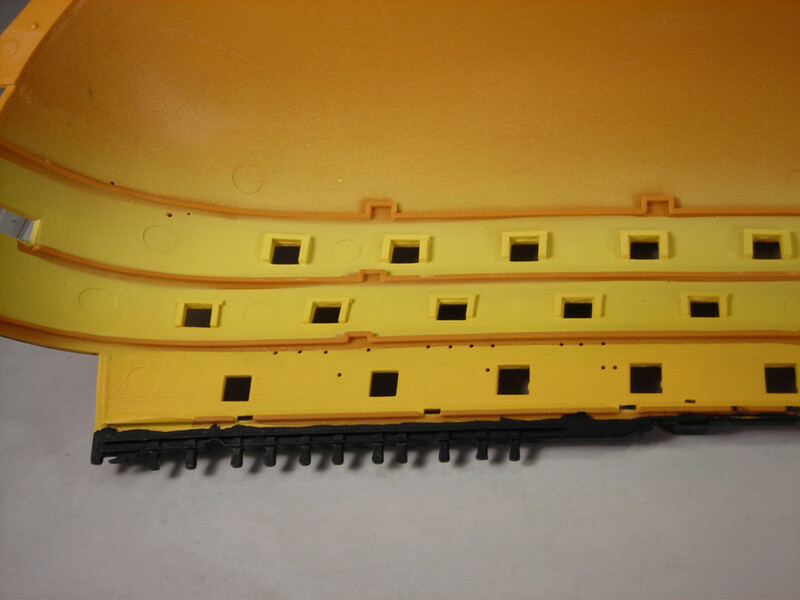 These are my Tamiya mix yellow painted rear window sections. I sprayed MM clear Gloss over the yellow to before I put the Tempera water based paint on them. When it was good & dry I wiped it off with a damp Qtip & soft damp rag. The first picture is before & the second is after with a mix of dullcoat & gloss over to seal the Tempera. I used Tamiya black over the bigger parts. 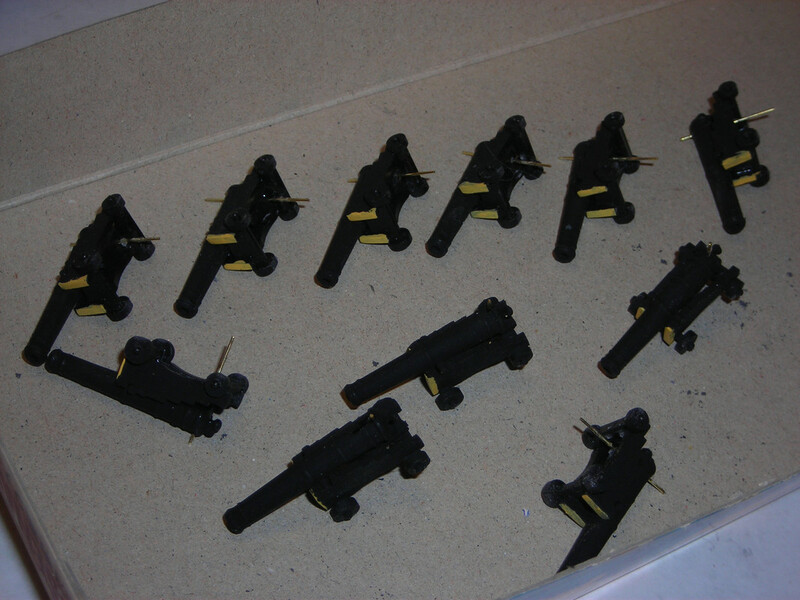 I have all my guns painted & am now drilling them for the piece of wire Iuse to fasten them to the deck. Anything I can never get to I want to stay put. I still have touch up & I will cut black decals to finsh the window sections. With my shaky right hand I need all the help I can get & decals & Tempera are a big help. On the blue arched front section I used a Tamiya mixed blue for the archs & my shaky hand to wield the fine paint brush. On the small places I could not paint , I mixed a Tempera blue to match my Tamiya. I painted the top blue parts with that & then wiped them off with damp Qtips again & sealed it with a lacquer spray. Worked real good & I outsmarted the shaky hand. Spooks me because I will be 88 next month. I still love building models & this gift from warshipguy has been a real winner. Thanks Bill. Gene1 - the mounted guns look great. As for shaky hands, I wish i could tell you how many times I have to retouch up something when my hand is shaking! !%*@ Your Victory is really coming together nicely !!!!! love your work gene , would love to see you in action , just to watch those shaky hand's working .